InnoKB is an innovative multi-user knowledge base software tool which helps create, manage and share a collection of full-text searchable databases by using web browsers over network. Each database consists of a collection of info items (namely articles), and each info item accepts HTML text as the article and a collection of files as attachments. You have the convenience of editing the articles within an integrated rich text editor, and uploading attachments effortlessly. Info items can be categorized with the customizable labels and sub labels which are tree structured. Searching databases is easy and fast, and you can combine labels into search criteria. InnoKB provides three web interfaces respectively for viewers, editors and administrators. Below is a screenshot running the editor interface within Apple Safari web browser. Click here to see more screenshots . The hierarchy chart below tries to illustrate the software architecture of InnoKB. This may help you have an idea of the way how InnoKB works, and how you manipulate databases with it. 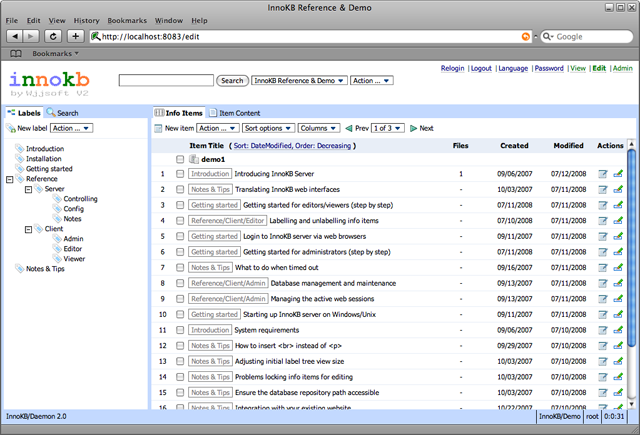 InnoKB is an easy to use web-based knowledge base management software. It is not a hosted web service, but actually runs on your own server computers. InnoKB has all the benefits in common with other web-based applications. You don't need to install any extra client programs but a familiar web browser is required at the client side, and upgrading the server suite did all the application upgrade tasks. Below is the brief list of key features & Benefits. To download a 30-day free trial version of InnoKB Server, please visit our download site.